As we all know by now, the 2011 earthquake and tsunami in theTōhoku region of the Pacific Ocean offshore was a undersea megathrust earthquake. It was off the coast of Japan and occurred at 14:46 JST (05:46 UTC) on Friday, March 11th, 2011. The epicenter was approximately 72 kilometers (45 mi) east of the Oshika Peninsula of Tōhoku, with the hypocenter at an underwater depth of approximately 32 km (19.9 mi). It was a 9.0 quake. By now, we are also aware that the earthquake triggered extremely destructive tsunami waves of up to 30 m (98 ft) that struck Japan minutes after the quake, in some cases traveling up to 10 km (6 mi) inland, with smaller waves reaching many other countries after several hours. Tsunami warnings were issued and evacuations ordered along Japan's Pacific coast and at least 20 other countries, including the entire Pacific coast of North America and South America. The Japanese National Police Agency originally had confirmed 11,362 deaths, 2,872 injured, and 16,290 people missing across eighteen prefectures, as well as over 125,000 buildings damaged or destroyed. 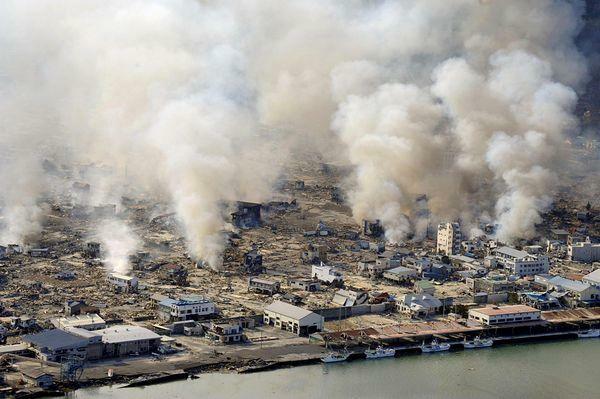 The earthquake and tsunami caused extensive and severe structural damage in Japan, including heavy damage to roads and railways as well as fires in many areas, and a dam collapse. Around 4.4 million households in northeastern Japan were left without electricity and 1.5 million without water. Nuclear reactors suffered explosions due to hydrogen gas that had built up within their outer containment buildings after cooling system failure. On 18 March, Yukiya Amanothe head of the International Atomic Energy Agencydescribed the crisis as "extremely serious." Residents within a 20 km (12 mi) radius of the Fukushima I Nuclear Power Plant and a 10 km (6 mi) radius of the Fukushima II Nuclear Power Plant were evacuated. Many electrical generators were taken down. Estimates of the Tōhoku earthquake's magnitude make it the most powerful known earthquake to have hit Japan, and one of the five most powerful earthquakes in the world overall since modern record-keeping began in 1900. Japanese Prime Minister Naoto Kan said, "In the 65 years after the end of World War II, this is the toughest and the most difficult crisis for Japan." The earthquake moved Honshu 2.4 m (7.9 ft) east and shifted the Earth on its axis by almost 10 cm (3.9 in). Early estimates placed insured losses from the earthquake alone at US$14.5 to $34.6 billion. The Bank of Japan offered ¥15 trillion (US$183 billion) to the banking system on March 14th in an effort to normalize market conditions. On March 21st, the World Bank Japan's government said the cost of the earthquake and tsunami that devastated the northeast could reach $309 billion, making it the world's most expensive natural disaster on record. Above is the chart for the time of the disaster occurred. Notice there are four T-square operating. Uranus (sudden explosions in the 8th house of life and death) T-squared the nodes. I leaned that any planet in the last degree of a sign brings out the worst effect of that particular sign. Uranus rules electricity also and millions of people were left without power. 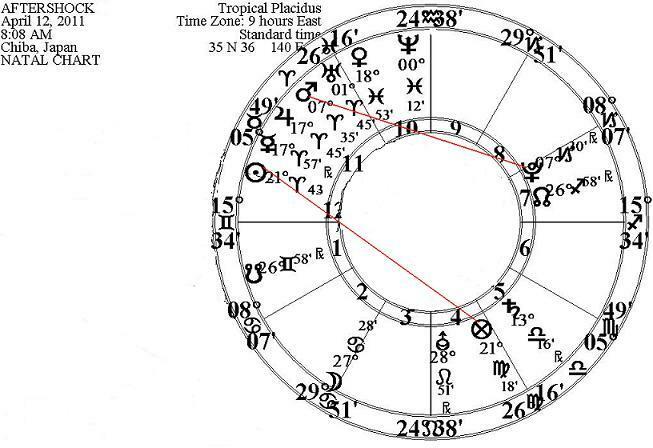 Neptune, also at 29 degrees, and the planet of sorrow, and a water planet opposes Transpluto, again, the 29 degree (in a fire sign..hence all of the fires that erupted) and squares the out of sign, Moon, which ties into the shock of the people.. The 7th house placement of Neptune reveals that other nations are concerned about radiation affecting them as well. Years ago, I read John Hawkin's book on Transpluto. He thought it might rule the sign of Taurus (money and values). So it fits that in the 1st house of the people, they might reevaluate their acceptance of using nuclear energy for their power: as it certainly has caused untold devastation, and billions of dollars! Pluto, which rules nuclear power, and total transformation T-squared the 3rd and 9th house cusps by 11 minutes of arc then. The 3rd house cusp describes how the disaster destroyed streets, roads, trains, and the auto industry. In other words, transportation and communications were all but impossible. The 9th house shows us that we were also affected, as the U.S. can't get the parts that we depend on getting from them for our auto industry. 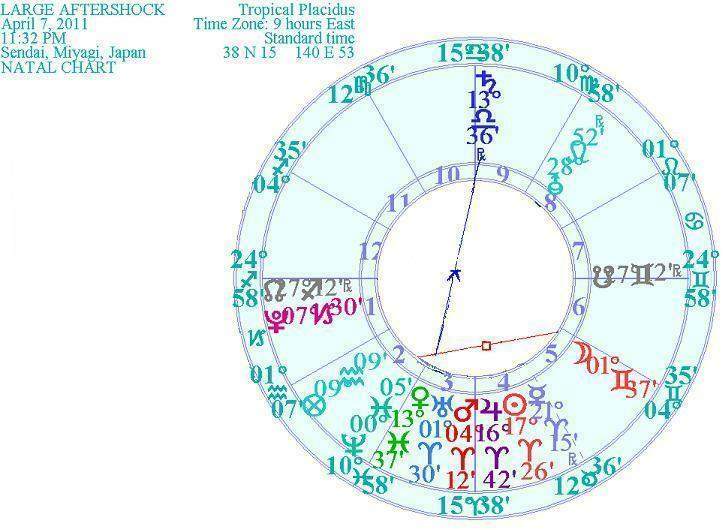 Venus in the 6th house of work, health and animals, T-squared the 4th and 10th house cusps. The 6th house shows how the people are afraid of being contaminated by radiation; that it could be in their food and everything else. Many of the reactor workers were heavily contaminated with radiation while trying to stabilize the reactors, and will die because of it! The 4th house cusp ties into the total devastation of their homes and the tremendous loss of lives they suffered. The 10th house cusp in Taurus shows how much money the whole thing is costing, and how the rest of the world is contributing funds to help them financially. As if that wasn't bad enough, a 7.4 magnitude aftershock hit just off the coast of Japan at 11:30 PM JST (1430 UTC) on Thursday, April 7th. The epicenter of it was just 73 miles from the nuclear plant at Fukushima and 41 miles from the epicenter of last months' 9.0 earthquake. 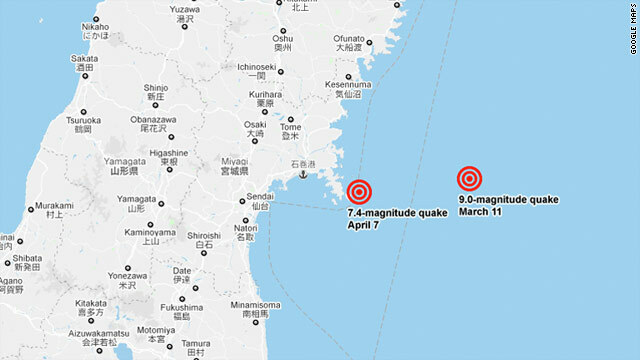 As such, Japans meteorological agency issued, and then lifted, a tsunami warning for a wave of up to 6 feet for the coastal area that has been already torn apart by the March 11th earthquake and tsunami, which is believed to have killed some 25,000 people and have sparked an ongoing crisis at the nuclear power plant. That tsunami was estimated to be higher than 120 feet. Notice that retrograde Saturn was inconjunct Venus by just 1 minute of arc. Again, the ground rumbled, and was strongly felt for what seemed a long time, as far away as Tokyo. I find that inconjuncts are important and should be strongly considered. The Moon, interestingly enough, was in Gemini again, and squaring Neptune. However Neptune had moved on into Pisces, and was out of that treacherous 29th degree. Uranus has moved on from 29 degrees and has moved on into the sign of Aries. And Transpluto has retrograded back to 28 degrees. Just as I was winding this article upon Monday evening, another 7.0 aftershock hit Japan again, near Tokyo. However, there with no reports of damage or tsunamis this time either. However, with Mars was squaring Pluto by 5 minutes of arc and coincides with an announcement that was just released by the Japanese nuclear-safety authorities. On Tuesday (in Japan) they raised their assessment of the crisis at the Fukushima Daiichi power plant to the same level as the 1986 Chernobyl disaster. A Nuclear Safety Commission official speaking on national television said the amount of radiation leaking from the Fukushima plant so far was around 10% percent of that released in the accident in the former Soviet Union. Japans nuclear safety regulators put the crisis at level 7, the highest possible rating on the international scale, which had so far only been assigned to the Chernobyl incident. So as a further precaution, they are moving people even farther back from the leaking reactor . And with the Pluto connection, authorities announced that they are very worried about their future financial and economic position because of all of this. The Sun was inconjunct the part of fortune by 25 minutes of arc. This affliction in the 4th house of the foundation shook the ground once again; quite violently. This news was very worrisome, and meteorologists say that because there was such a huge earthquake initially, there could be many more aftershocks to come. At any rate, we will just have to watch to see how the aspects play out, and hopefully there won't be any more bad news; especially on May 5th, when the Moon is in Gemini again.